Does cutting taxes stimulate job growth? Is there any evidence to support the mantra that cutting taxes stimulates job growth? I’m old enough to remember the Reagan years, and it seems most of those tax cuts went into the pockets of the wealthy, and what trickled down was pink slips as jobs went offshore. Was that an anomaly, or par for the course as tax cuts go? —Keynes Friedman Locke Jr., Greenspan, Minn. Touchy subject. The truth is, what arguably began as a noble effort—making U.S. income taxation fairer and more rational—has degenerated into one of the great con games of our time. First, the big picture. While cutting taxes to boost the economy is commonly associated with Ronald Reagan and supply-side economics, the underlying “trickle-down” idea is an old one: If you let the people on top keep more of their money, they’ll invest it in business, creating jobs and eventually making those below better off. John Kenneth Galbraith cynically referred to this as the “horse & sparrow” theory: “If you feed the horse enough oats, some will pass through to the road for the sparrows.” But there’s some sense to it. Income taxes when Reagan took office were confiscatory—the top-bracket rate was 70 percent. Few actually paid it, of course. Over the years, the wealthy had gamed the system to create a seamy mess of loopholes to avoid taxation. Reagan changed that. The top rate was cut sharply—today it’s 35 percent—and many tax shelters were eliminated. The result wasn’t a flat tax, but it was flatter and more transparent than before. But Reagan didn’t change the other side of the big-government equation. In his influential 1981 book Wealth & Poverty, George Gilder argued that tax cuts needed to be balanced with public spending cuts. Reagan skipped that part. He cut back on social programs, but cranked the defense budget. The excuse was the infamous Laffer Curve, the brainchild of economist Arthur Laffer, who reputedly sketched it on a napkin during a 1974 power lunch. The curve plotted tax revenue against tax rates, supposedly showing lower rates would spur the economy and produce a net increase in government revenue. Magic? No, the start of the con. Reagan’s first budget director, David Stockman, later admitted to journalist William Greider that he pushed through the 1981 tax cuts knowing full well they would lead to massive federal-budget deficits. He hoped this would keep Congress from spending on domestic programs. 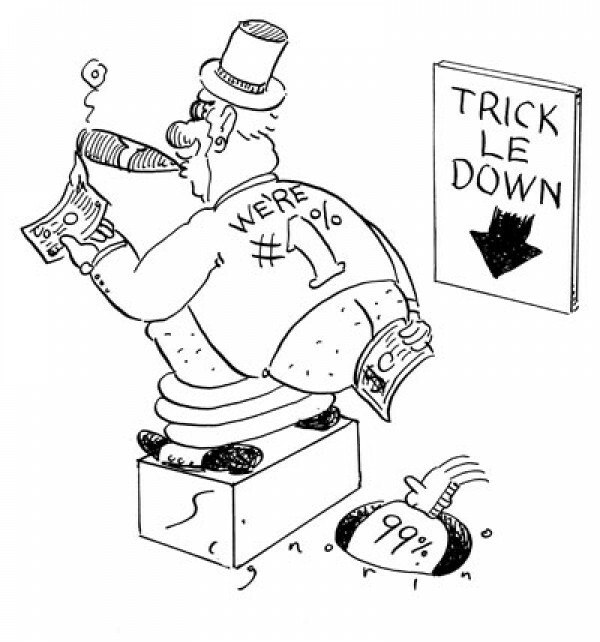 How did this bastardized version of trickle-down economics work out for those on the bottom economic rung? On the face of it, not too well. Reagan took office with a 7.5 percent unemployment rate. By September 1982, it had climbed to more than 10 percent and didn’t drop below 7 percent till halfway through his second term. From 1979 through 2004, the real after-tax income of the poorest fifth of the country rose by a paltry 9 percent, while that of the richest fifth rose by 69 percent. Over roughly the same period, CEO pay rose by about 500 percent. That’s not the con, though. The real cause of growing U.S. income disparity isn’t tax policy but globalization. What with competition from China and other low-wage countries, U.S. workers are in no position to demand better pay. It’s the crowd whose skills can’t be easily outsourced, known as the creative class if you’re part of it or the 1 percent if you’re not, that’s made off with most of the enormous increase in wealth of the past 30 years. Which brings us to the con. A string of millionaire candidates for public office has duped a good chunk of the electorate into thinking the way to create jobs and otherwise solve the problems of the middle class is to cut the taxes of the wealthy. That’s absurd. If the massive tax cuts of the Reagan era didn’t do the average worker much good, trimming another percent or two now sure won’t. What it will do is leave more money in the pockets of the comfortably affluent. Why does this self-serving argument fly? Because too many Americans don’t get where they stand in the scheme of things. The U.S. has one of the most unequal distributions of income in the developed world—we’re closer to Latin America in that respect than to Europe—and perilously low economic mobility. But much of the country’s workforce believes it’s either already in the overtaxed bourgeoisie or on its way there. The top 10 percent of filers shoulder most of the income tax burden (about 70 percent in 2009). For a typical U.S. wage-earner to worry about sharing in this plight is borderline delusional. Don’t misunderstand. Keeping taxes at a moderate level is a good thing. Arthur Laffer makes the legitimate point that in 1925, 1965 and 1985, cutting taxes from very high levels to more reasonable ones caused the economy to boom. But know this. While cutting taxes sometimes may help the country as a whole, if you’re like most people, it probably won’t help you.